Blue Puya, or Turquoise Puya, is a bromeliad and closely related to the pineapple. The plant is a rare specimen that hails from Chile in the Andes Mountains. It is part of several cactus and succulent plant collections but is not found wild in North America. Seeds are available to order or you may be able to get a hold of a division if you are lucky. These are the two main ways of propagating Puya plants and enjoying for yourself the majestic flower spires and classic rosettes of this succulent. Read on to learn how to grow Blue Puya and astound your friends and make fellow gardeners envious with the daring and bold form. Puya berteroniana is an arid climate terrestrial bromeliad. The plant is sold under the name Aqua Sapphire Tower which is an appropriate description for the infrequent colossal flower clusters it produces when mature. The Blue Puya plant is found in the upper elevations of arid Chile. It is a hardy plant that grows 3 to 4 feet (0.9 to 1.2 m) in height from a basal rosette form of silvery gray leaves with toothed edges. The flower stalks may be up to 6 to 7 feet (1.8 to 2.1 m) in height and are decorated with magnificent turquoise flowers with deeply orange anthers. The effect is quite impressive and unique in the plant world but it may take 6 to 8 years for flowers to appear. Over time the plant will form offsets or pups. These are easily divided up as an easy way of propagating Puya plants. You can get Puya seed and start the plants yourself in a greenhouse. Puya are slow to germinate and require temperatures of at least 70 degrees Fahrenheit (21 degrees Celsius). Use a well-drained potting soil in a seed flat. Keep the seeds moderately moist until they sprout. Once you see seedlings, move the flat to a brightly lit area with protection from the harsh light of midday. Transplant the seedlings when they have formed a rosette. Plants can tolerate a crowded pot. In USDA zones 8 to 11, you can transplant rosettes to the garden but in other zones they will have to be moved indoors in winter. Up until the cold temperatures appear, Blue Puya makes a great patio specimen. Water Puya plants in the ground once per week in summer. Potted plants should be watered when the top couple of inches of soil have dried out. Water the plant only once per month in winter when the plant is dormant. Fertilize with a diluted succulent food or indoor plant food in spring. Remove spent foliage from the rosettes for best appearance. The pups can be cut away with a sharp, sterile knife and potted up for a new supply of the plants. 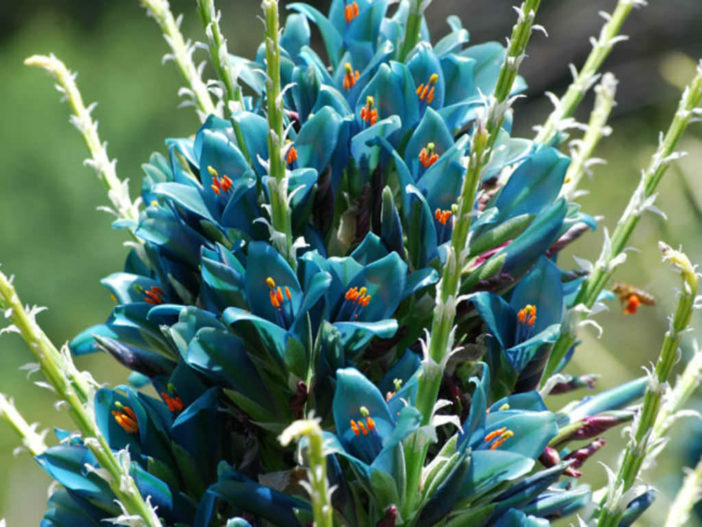 Blue Puya care is easy as long as you have well-drained soil, a fairly sunny location and warm temperatures. The plants are even drought tolerant for short periods once established.